Microsoft has been rapidly shifting strategy lately, writing off the Nokia acquisition and taking a lot more conservative approach for the next generation smartphones. Still it seems the company will not cancel any phones that were already in development when the strategy change happened. Microsoft is expected to release one of two phones annually in three different categories - flagship, business and value. Yet this won't happen until next year at least. Meanwhile Microsoft is prepping the rumored Lumia 940 and Lumia 940 XL flagships with Quad HD AMOLED screens, Snapdragon 810 chips and 20MP PureView snappers. But it is also developing three affordable handsets as well. 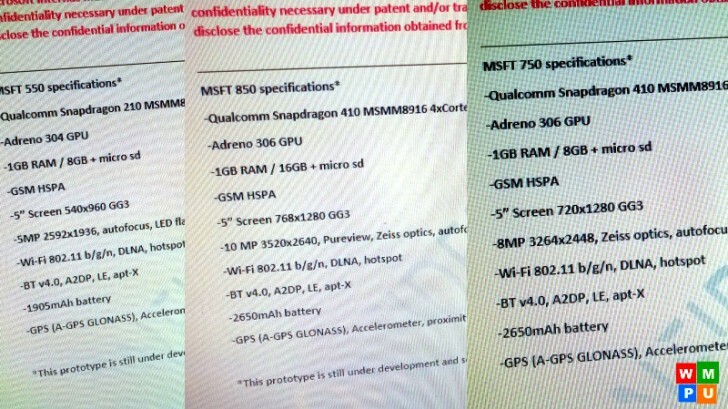 Leak documents now shed some light on their mid-range backup - Lumia 550, Lumia 750 and Lumia 850. According to those the Lumia 550 will come with a 5" qHD display and run on Snapdragon 210 chip (quad-core 1GHz Cortex-A7 CPU, Adreno 304 GPU, 1GB RAM). There is a 5MP AF main camera, a 2MP selfie cam, 8GB expandable storage and a 1,905 mAh battery. Lumia 750 ups the 5" display resolution to 720p, bumps the chip to Snapdragon 410 (a quad-core 1.2GHz Cortex-A53, Adreno 306, 1GB RAM). The main camera is an 8MP unit with ZEISS optics, plus there is a 5MP selfie snapper. Lumia 750 will offer 8GB expandable storage and will be powered by a 2,650 mAh battery. Finally, the Lumia 850 is touted to pack a 5" 768p display, Snapdragon 410 chip with the CPU clocked at 1.4GHz, 1GB RAM and a 10MP ZEISS camera. The rest of the interesting specs include a 5MP front snapper, 16GB expandable storage and a 2,650 mAh battery. All three phones are protected by Gorilla Glass 3, lack LTE support and dual-band Wi-Fi, and run on Windows 10 for Mobile. Microsoft has an IFA event coming up on September 4, but it will focus on Windows tablets and PCs. There is a good chance though it hosts another press meeting to show off some new Lumia phones, too. The rumor has it Microsoft will be launching the Windows 10 Mobile updates starting October, which means the Windows 10 flagship phone should be upon us. Lumia 850 , come's with 2 GB Ram and 5.6 inc 1080p disply its lodded snapdrigon 617 quad cir prossecer.